The business of wine is interesting and unique in many ways, but in other ways the same as any other business in that the basic questions need to be answered: What is the product mix? Who are the target customers? What value is being provided? On the product mix side, many wineries choose to make not only high end single vineyard wines, but also blends. These blends allow winemakers and wineries to place with different parameters: different vineyards, different varietals, different vintages, different price points. For example, many wineries make lower price blends, meant to be consumed immediately and made primarily for cash flow reasons. Not that these are low quality wines, just that they are lower priced wines, made for lower cost with less winemaker effort. Lori and I often buy these as our every day table wines. Peachy Canyon Incredible Red (a blend of primarily Zinfandel from multiple vineyards) is a good example of this, running about $10-12 per bottle. 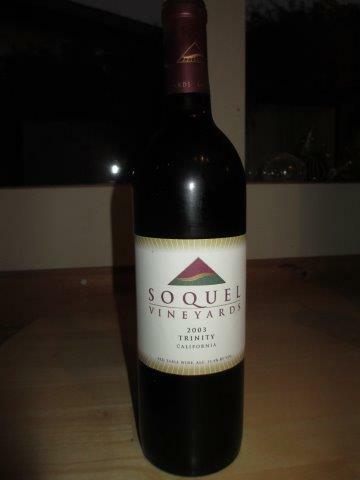 Another example of a winery making lower priced wines is Soquel Vineyards. For years they have made their Trinity wines, initially just the red but recently a white blend also. About 10 years ago, after tasting it at the winery, we picked up half a case of the 2003 Trinity, which that year was a Bordeaux varietal blend. We had a bottle not too long after purchasing, and enjoyed it then, and again not too long after that. Both times we remarked how this was a really nice wine, well balanced, and might actually age well. So we didn’t open another bottle for another couple of years, and sure enough, that one was pretty good too. Fast forward to a couple of weeks ago, and we opened bottle number 5. Darn good bottle, especially with the steak we put on the barbeque. But about at its end; it’s not going to get any better with any more time. So number 6 will be opened soon. Soquel Vineyards has long been one of our favorite wineries in the Santa Cruz Mountains area. Very good wine from top to bottom, and very nice people. And in this case, they got lucky with blending some grapes with better than expected quality. The result was a great wine, or at least a great value wine. We had another example of a lower priced blend at a restaurant last night: the Sokol Blosser “Evolution” white blend. Evolution White is a blend of Pinot Gris, Müller-Thurgau, White Riesling, Semillon, Muscat Canelli, Gewürztraminer, Pinot Blanc, Chardonnay and Sylvaner grapes. So, is this just a blend of leftovers, or is it done deliberately? Sokol Blosser won’t say, but they play up this aspect with “Luck versus Intention” on the label. My best guess is that it’s a little of both intention and leftovers. In any case, this was a nice white to go with the blackened fish tacos I had, and the grilled shrimp salad that Lori had. Another blend strategy is executed by Armida Winery. They have taken their blend and made it into a real brand: Poizin. There is not just one Poizin, but three different blends, at three different price points and quality levels. There’s the lower end Poizin, available through various retail chains. There’s the mid-range Poizin, at about a $20 price point. Finally there’s the Poizin Reserve, packaged in a coffin-shaped box. “Poizin, the wine to die for.” I just had a glass of the mid-range 2012 Poizin to wash down my chopped liver sandwich. Delicious! Plus, they’ve expanded the brand to include “Antidote”, a white blend. Blends are an interesting topic, given the breadth of blends. From high end Bordeaux style blends to mid-range Rhone style “GSM” blends to the lower priced wines discussed above, from field blends of different varietals from one vineyard to carefully mixing and matching vineyards and varietal clones, to even more variations on the parameters, there’s a lot that can be done with blends. I’ll spend more time on blends in upcoming posts. This entry was posted in wine blends and tagged Armida Winery, Peachy Canyon Winery, Poizin, Sokol Blosser, Soquel Vineyards on January 18, 2015 by vvblogman.